At the smoothly run and enjoyable homecoming for both minor and senior teams in Pearse Stadium on Monday, Galway minor hurling manager Jeffrey Lynskey quoted the old Meat Loaf classic “Two out of three ain’t bad” to describe Galway’s terrific 2-17 to 2-15 win over Cork in the All-Ireland minor final. Two years ago Lynskey, who has Shane Cusack and Gavin Keary with him as two top quality selectors, managed Galway to a super success over Tipperary - hence his “two out of three “ quip. Last Sunday’s win was a hugely impressive minor final victory for the county, and one of the best in recent times against a highly-rated Cork Outfit. Galway’s historic double day started rather badly with Cork’s highly rated forward Brian Turnbull putting the ball in the Galway net after only seven seconds. It was a goal that should not have been conceded had Galway custodian Darach Fahy been a bit faster off his line. Galway were caught cold and that can happen any team or any player. However, when that sucker blow was followed by an Evan Sheehan major for the Rebels on 12 minutes, the few thousand early Galway supporters who were in Croke Park for the first few minutes of the minor game were getting a bit concerned and edgy. This was after all a highly-rated Cork side, taking on a Galway outfit that was not really fancied by many - apart from those on the inside track. Lynskey’s young men found themselves 2-3 to 0-3 behind following Sheehan’s goal, but crucially and not surprisingly for a team coached by the Liam Mellow’s man, they did not lose heart. 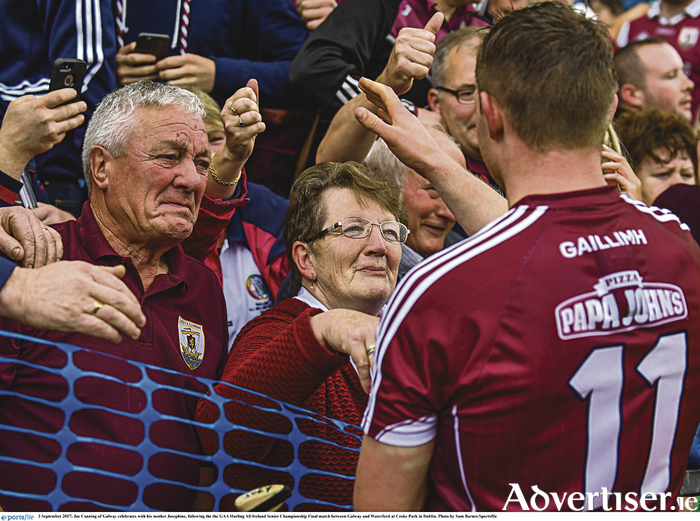 The Galway ship was steadied when Turloughmore’s Daniel Loftus, despite wearing number three on his back, popped up to throw over a point and when Conor Molloy added a free, it helped to calm Galway nerves. Molloy had come in as a forward for injured midfielder John Fleming with Conor Walsh moving out around the middle. There was little between the sides for the rest of the half, with Donal Mannion, who lined out at full-forward, doing well in that first period. In addition to hitting a point, his direct running was causing problems for the Cork defence. Seán Bleahane, who had a fine game hitting five points, also started to come more into the game. After being set up by Mannion, the Ahascragh/Fohenagh youngster fired over his third in a row to reduce the gap to 2-7 to 0-9. When free-taker Conor Molloy raised another white flag, it left only a goal between the sides at half-time, and considering the start Galway had, that scoreline represented a fine recovery. Much had been expected from Portumna’s Jack Canning following his 1-4 against Kilkenny in the semi-final, and he had the sliotar in the Cork net come the 31st minute after a super run from Donal Mannion, which left a few Cork defenders in his wake. Mannion has super pace and his pass to Canning created the goal that was superbly dispatched. The game took on a real life of its own then. The next six scores were shared evenly with the game level, when on 38 minutes, Canning intervened to make his mark, as his uncle has done so often at senior level. He fielded a Conor Walsh delivery on the edge of the square, turned the Cork full-back and captain Seán O’Leary Hayes, and rifled the ball high into the roof of the Cork net. It was the first time Galway led, and there was no looking back. They had a small bit of fortune though when a Cork goal was disallowed for a square ball against their full forward Robert Downey in what had to be a tight call. Galway took some lift from that disallowed goal and Conor Molloy (free ), Bleahane, and Canning all raised flags to move clear by five points, 2-16 to 2-11. Cork rallied the best they could. Points from Barry Murphy, Robert Downey and Turnbull brought the young Rebels close, but they had a few wides and were a tad unfortunate not to have scored a goal in the last few frantic moments of an enjoyable game. So an 11th minor title for Galway and the Irish Press Cup is back in the county for a second time in two years. From the Galway 2015 minor squad, young players such as Seán Loftus, Jack Grealish and Thomas Monaghan have all graduated to the senior squad. They now have won senior medals as well, which is a terrific achievement and represents super progression and development for them on an individual basis. The medium term objective now for some of the more talented and committed players on this year’s All-Ireland winning squad is to try to join that trio in the senior and U21 ranks over the coming few years. Scorers for Galway: - J Canning (2-2 ); C Molloy (0-7, 0-7 frees ); S Bleahane (0-5 ), D Mannion, D Loftus, B Moran (0-1 each ). Subs used: Shane Ryan (Clarenbridge ) for McManus (30 ) Sam McArdle (Clarenbridge ) for Loftus (53 ); Mark Kennedy (Clarenbridge ) for Moran (55 ); Enda Fahy (Cill Fheichin ) for Walsh (61 ).